National Pink Day & National Selfie Day In One Week?! Happy Friday Ya’ll as well as Happy National PINK Day! I can’t think of a better holiday to spend here at Sugar Fix Dental Loft. As you know, and could probably tell by our website, is we LOVE pink. 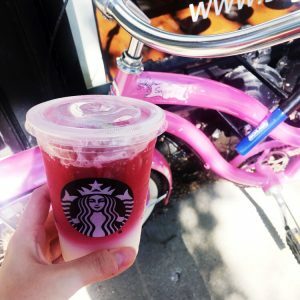 So you know the Sugar Squad is headed across the street to Starbucks and pick us up some Pink Drinks and the new Pink Ombré Drink! We had so much fun this week after having our team building week last week. We had a new patient who had come to us and expressed that she was a bit nervous to be in the dental chair. Dental anxiety is a very common feeling to have. That is why here at Sugar Fix Dental Loft, Dr. Jessica Emery strives to show our patients the care and comfort they need in order to keep their smiles healthy. Our patient needed multiple restorations to be completed. She was nervous that she was going to have to be in our office for multiple visits in order to get everything done. But to her surprise, we informed her that the great thing about arriving in our office is that she can get all of her work completed in one day! All thanks to our amazing Cerec CAD/CAM Technology. She was able to cozy up with a cashmere blanket, warm lavender neck pillow, and choose a movie on Netflix to watch in her chair. Not sure what our Cerec machine can all do? Check out our other blog HERE for more details! Oh, and by the way, did you know it was National Selfie Day on Wednesday?! 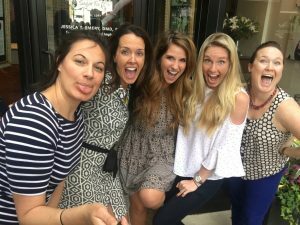 Check out our group selfie below! National Selfie Stick Day with the Sugar Squad! We hope you all have a fun filled weekend and see you next week!